Read what my clients say about my services. We've included the original notes to show the heartfelt response to our healing! Elisabeth Lindberg is a gifted and talented certified massage therapist. I have been a customer of Elisabeth Lindberg's for 18 years. She constantly studies and learns new techniques to enhance and improve her practice: Aromatherapy, Hot Stones and Lomi Lomi to name a few. when you visit Elisabeth, you will be impressed with the number of diplomas and certificates she has earned in her field.. Initially, Shiatsu, Reflexology and Reiki were my favorites. However other clients began talking about how wonderful Aromatherapy and Lomi Lomi were and I had to try them. I was impressed. Elisabeth's prices are reasonable, and Elisabeth is the consummate professional. She is the mother of five and now a grandmother. She respects and values her clients as she respects and values her children. I am in awe of her skill and talent and highly recommend her. 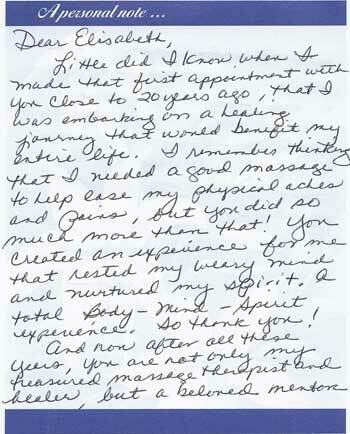 Little did I know when I made that first appointment with you close to 20 years ago, that I was embarking on a healing journey that would benefit my entire life. I remember thinking that I needed a good massage to help me ease my physical aches and pains, but you did so much more than that! You created an experience for me that rested my weary mind and nurtured my spirit. A total Body-Mind-Spirit experience. So thank you! Elisabeth is a very insightful and experienced massage therapist. I try to see her at least once a month for a massage with hot stones. She always seems to know just what I need to help relieve the pain from my fibromyalgia condition. I highly recommend her. 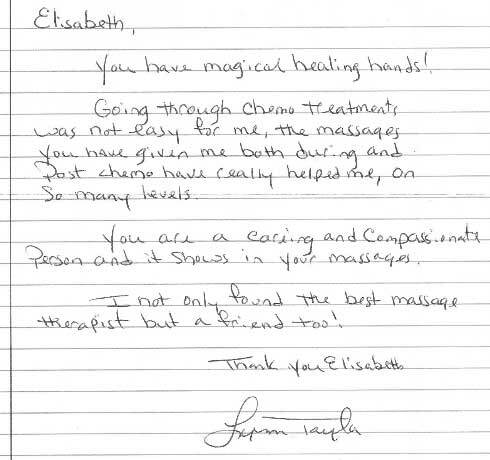 Elisabeth Lindberg's massage is both relaxing and healing. I am happy to say that I have been her client for many years. She is simply amazing. I have experienced numerous benefits from her healing work and look forward to many more. You have magical healing hands! Going through chemo treatments was not easy for me. The massages you have given me both during and post chemo have really helped me, on so many levels. You are a caring and compassionate person and it shows in your massages. I not only found the best massage therapist but a friend too! I have known Elisabeth and have availed myself of her multi-disciplined abilities for more than a decade; she is also a friend. 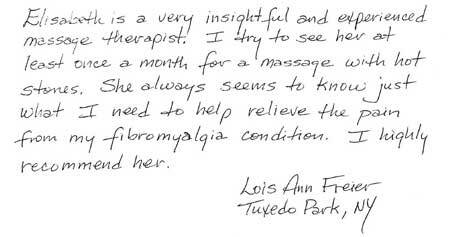 Her studies and knowledge of the body enable her to relieve tension and muscular discomforts effectively. Her quiet and set-apart studio also provides a pleasant and relaxing atmosphere. 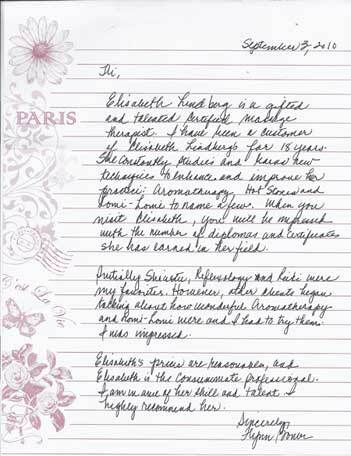 Elisabeth is certainly worth a try. I recommend her. I recommend Elisabeth without reservation and promise you will not be disappointed. 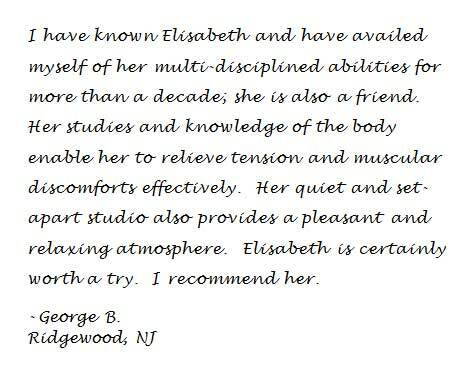 I have been a client of Elisabeth Lindberg for over six years and can say without hesitation that she provides the best massage I have ever experienced. Her studio is warm and inviting and makes you feel at home immediately. The soothing music combined with Elisabeth's soft and subtle hands make for an unforgettable experience. I always opt for the 90 minute massage and it seems to go by in a minute. When it is over, I immediately look forward to my next visit.